These techniques for vegetation analysis were developed for satellite imagery, but at Public Lab, we've been working a lot on capturing infrared imagery using our DIY near-infrared camera setup, and combining it with visible bands to produce NDVI images such as the one above. What exactly are these images we're trying to make? What do they tell us about vegetation, and why? These diagrams should help to understand what it is we're doing and why these are good ways to analyze plant life. The result can be false-colored to make the high-photosynthesis areas more clear, and used to examine where plants are and how healthy they are. 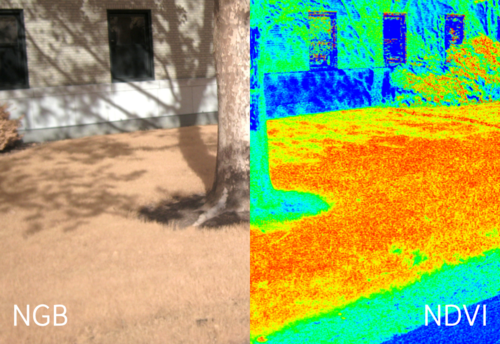 Some people are also interested in producing NRG imagery (like the below image), where Near-Infrared, Red, and Green are used to compose a picture instead of the usual Red, Green, and Blue. In NRG images, the deeper and clearer the red color, the denser and healthier the vegetation (more or less). This topic is part of the Grassroots Mapping Curriculum series.